In late August, Vice President, Gillian Kingston, and General Secretary, Ivan Abrahams, traveled to the beautiful town of Torre Pellice in northern Italy to attend the Synod of the Waldensian Church and OPCEMI (the Methodist Church in Italy) and to present the 2017 World Methodist Peace Award to OPCEMI. 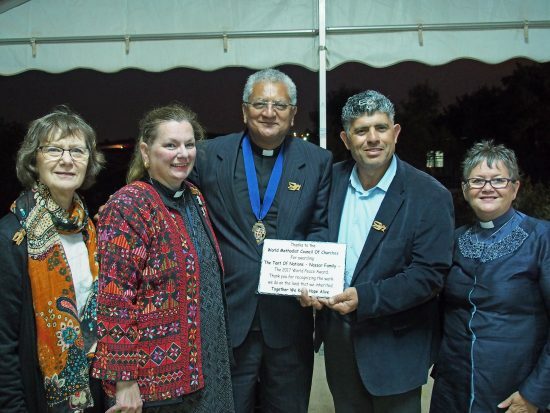 Later, in mid-October, they traveled to Bethlehem to take the Award to the Nassar family, on whose farm outside Bethlehem, the Tent of Nations offers a meeting place for those committed to peace and reconciliation. The award is made on the basis of courage, creativity and consistency and members of the WMC Steering Committee saw these qualities in abundance both in the work OPCEMI has been pursuing with migrants and refugees since 1989 and in the four-generation commitment of the Nassar family to peace. At Torre Pellice, addressing the Synod of the Waldensian and Methodist Churches, the Vice President spoke of the origins of the Peace Award in her home country of Ireland, when, at the World Methodist Council of 1976 in Dublin, a plea was made by the late Revd Dr Eric Gallagher that peacemakers should be honoured. The first Award went to Saidie Patterson from Belfast, for her courageous, consistent and creative works across the community lines in that city at a time of violence and civil unrest. ‘Sometimes the Award has gone to people whose names are in the world’s news headlines; sometimes it goes to otherwise unsung heroes and heroines whose quiet work is known only in their own communities,’ the Vice President observed. The General Secretary presented the Award on its distinctive blue ribbon to Ms Mirella Manocchio, President of OPCEMI, who responded on behalf of the church (as reported in the September FFL). The family’s spokesperson, Daoud, accepted the Award medallion on behalf of the Nassar family; he then promptly and movingly invited his mother, Meladeh, to come forward and have it placed round her neck, so acknowledging her vital role in the formation of the family and its values. The Award ceremony happened during a visit of the WMC Inter- Faith Committee’s pilgrimage to the region, exploring issues of peace and water justice. During the afternoon, members of the group assisted with the planting of a lemon tree to commemorate the event.